You Gave Us Messiah But Not The Torah: Dayeinu! Dayeinu is one of the highlights of Seder experience. The tune is catchy but the words and theme are frankly bizarre. Had you taken us from Egypt but not split the sea, dayeinu, it would have been enough. Really? If you had taken us to Mount Sinai but not given us the Torah, dayeinu, it would have been enough. Really? Don’t we talk about how the Torah is the air that we breathe, indispensable to our lives and to our very existence? Had He given us the Torah but not brought us into Israel it would have been enough. Really? Wasn’t Israel created before the world because it, the Jewish people and Torah and the three pillars upon which the world is built? I have to admit, as many times as I’ve recited or sung Dayeinu, I’ve never considered the idea if stopping short of completing all the miracles Hashem did for the Children of Israel in the Exodus would indeed have been sufficient. What if God liberated Israel from Egypt but had not split the sea? That would have been a disaster. As Rabbi Goldberg says, for religious Jews, the Torah is the very air they breathe, and the Land of Israel was promised to the Jewish people long before they were enslaved in Egypt. How could these things not come to pass as God declared they would? How can we imagine the Jewish people without the Torah or Israel? I know what you’re thinking, some of you anyway. You’re thinking about the Mixed Multitude, that ragtag group of non-Israelites who accompanied the Children of Israel out of Egypt because they saw Hashem’s miracles and believed, or at least they thought this guy Moses could give them a “get out of slavery free” card, too. You’re thinking that these Gentiles stood with Israel at Sinai and received the Torah along with God’s special and chosen people, and thus, what was done for Israel was done for Gentiles as well. The “Mixed Multitude” link I posted a few paragraphs above goes into it in more detail, but these Gentiles, or rather their descendants after the third generation, were fully assimilated and intermarried into Israel and the tribes, so all traces of their Gentile lineage was lost. That practice isn’t available to non-Jews who want to join themselves to Israel today. The best we can do is either become Noahides or convert to Judaism. For those of us to call ourselves “Messianic Gentiles” or Talmidei Yeshua, a third option is to specifically accept a highly specialized understanding of the revelation of Yeshua (Jesus) as Moshiach (Messiah or “Christ”) while taking upon ourselves a lesser set of obligations than the Jewish people, and while standing alongside Israel and embracing her central role in Hashem’s plan for ultimate, worldwide redemption in the Messianic Kingdom. Which brings me back to Dayeinu. What if God had given us the blessings of Messiah but not given us the Torah…Dayeinu…it would be sufficient. But God did allow us, through His magnificent grace and the mercy of Messiah, to benefit from some of the blessings of the New Covenant promises but not the full obligation to the Torah mitzvot? Is that really sufficient? Back in the days when I was attending a little, local Baptist church, more than once in Sunday school, I heard the teacher thankfully remark how grateful he was to not be “under the Law” and enslaved to all those spiritless rituals and practices. Actually, he said he was grateful to “no longer be under the Law”. I’ve always wondered what Christians mean by that, since Gentiles are not born into a covenant relationship with God, and particularly not under the Sinai covenant, thus, we were never, ever “under the Law” to begin with. There’s a reason I don’t go to church anymore. Rabbi Nachman Cohen in his Historical Haggada offers a fantastic insight. If you look at the Torah and in Psalms, chapter 106 in particular, you will notice that every stanza of dayeinu corresponds with an incredibly gracious act God did for us and our absolute ungrateful response. Explains Rabbi Nachman Cohen, dayeinu is our reflecting on our history and repairing the lack of gratitude we exhibited in the past. 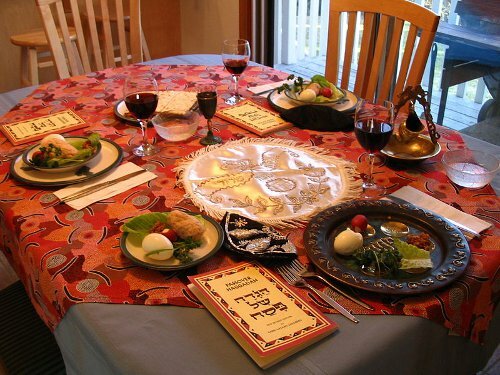 Seder night we look back on our national history, we review our story and we identify those moments, those gifts from God that we failed to say thank you for. We rectify and repair our ingratitude and thanklessness through the years by saying dayeinu now. In truth, dayeinu, each of these things was enough to be exceedingly grateful for. R. Goldberg uses examples such God taking the Israelites out of Egypt and them not being grateful (Deut. 1:27) and God feeding them with manna and them not being grateful (Numbers 11:1-6). Dayeinu then, as R. Goldberg explained above, is the Jewish effort to repair the historic lack of gratitude of the Israelites to God’s miracles during the Exodus. It’s a lesson to every Jewish child at the Passover seder to learn gratitude for all that God has done, does, and will do for Israel. So how can I use Dayeinu as an example of it being sufficient for we Gentiles to have the blessings of the New Covenant (without being named covenant members) and not receiving the Torah or the Land of Israel along with the Jews? I do it by turning things around. I do it by pointing out our own ingratitude. A small but vocal group of non-Jews do not accept that only the Jewish people are Israel, and that only the Jewish people have it placed upon themselves as named members of just about every covenant God has ever made with human beings, the full obligation and blessings of the Torah mitzvot. They not only desire but demand full inclusion into Israel, and full obligation to the mitzvot, effectively becoming Jewish converts without a bris. I should point out that many normative Christians, who couldn’t care less about the Torah, still believe that when Jesus returns, the Church will inherit the Land of Israel and all of the covenant promises God made with the Jewish people. The Jews however, unless they convert to (Gentile) Christianity, not so much. That’s also a lack of gratitude and humility. It is better to take the seat for the least honored and then perhaps be given more honors, than to assume you have the greatest honor and to be publicly “demoted” and thus humiliated by your “host,” that is, Messiah. In this case, us not being Jews, and not being Israel, it really is better to say “Dayeinu,” believe that what we have is truly sufficient, and if God wants to give us more, He’ll give us more. He’ll give, but we don’t presume to just take. 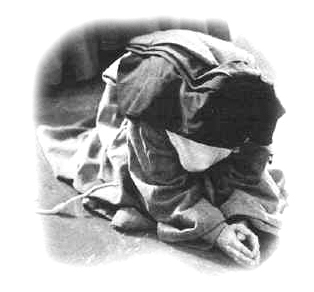 It is a terrible thing to turn up your nose at the blessings and mercy of God and to demand more. We’ve seen the consequences to the Children of Israel in the Torah when they were ungrateful. If they are the natural branches of the root and could still be removed for lack of trust, how much easier is it for God to remove the ungrateful grafted in branches? My family will be having our own wee home seder this coming Friday. While my Jewish family will be singing Dayeinu in the spirit of learning gratitude as R. Goldberg describes it, I’ll be learning to be grateful in a very different way, by accepting that what God has done for me, a non-Jew, a non-covenant member, is indeed not just sufficient, but abundant. James, you studied psychology, right? So you should know that One Law Messianics have a fundamental psychological need to know that they have a Heavenly Father who cares enough for them to have provided complete and clear instructions for achieving good. They’re not promoting this teaching to be arrogant. On the contrary, there is no other psychologically viable option. If G-d doesn’t care about us, there is no life worth living. I’m not defending One Law here per se, just trying to get you to understand the psychology behind it. Also, you mentioned that One Law Messianics think they can become Jewish converts without a bris. In reality, One Law Messianics recognize the Scriptural reality that (1) conversion occurs in the heart prior to circumcision just like it occurred with the first convert Avraham; (2) the Apostolic writings include Gentiles in Israel; (3) the binding precedent from the Torah says that everyone in Israel is bound to keep the Father’s Instructions (i.e. Torah of Moses); (4) this also means that One Law Messianics are then required by Torah to get circumcised (though not for salvation but rather as continued obedience to the covenant). In short, we do believe in circumcision but just not as the point of conversion. Rather, circumcision is seen more as a ratification of a pre-existing covenantal relationship. Peter, I think all people of faith have a fundamental need to know that God loves us, so One Law adherents are not unique. However, I believe (and you know this all too well), that God’s expectations for each of us, at least in the fine details, aren’t “one size fits all”. As I’ve explained numerous times, Israel, that is, the Jewish people, have a unique and highly specific covenant relationship with God that even we non-Jewish Yeshua believers don’t have. Therefore, God’s expectations of Israel and His expectations for we “grafted in” and “honorary” (I’m using the term somewhat loosely) covenant “members” (since we are not named participants in the New Covenant) differ. Being different from Israel does not make us less loved by God. Paul was very specific about this in Galatians, among other of his epistles. We are all one in God’s love, but Jews are still Jews, and Gentiles are still Gentiles, even as we co-exist within a single ekklesia. I know that you and others, as you say, have a “fundamental psychological need to know that you have a Heavenly Father who cares enough for you to have provided complete and clear instructions for achieving good,” and that you define “clear instructions” as the Torah of Moses. I disagree. I believe some sub-set of the Torah applies universally, but not the entire set of 613 commandments (or whatever number is possible for even an observant Jew to perform without the Temple, the Priesthood, and the Sanhedrin, and also living outside the Land of Israel). The argument has been made that a non-Jew can potentially take up at least some of the mitzvot they/we are not obligated to perform on a voluntary basis. That’s fine and well. Some keep a form of (Leviticus 11) kosher as well as, in some manner, a Shabbat observance. The day my Jewish spouse becomes completely shomer shabbat, so will I (assuming she doesn’t want me to be her “Shabbos Goy”). However, that wouldn’t make me “obligated” to observe Shabbos, I’d just be living in the same house with my observant wife and voluntarily sharing in a Shabbos rest. Being married to a Jewish wife who is not a Yeshua believer, and having observed at length her efforts to become more integrated with the local Jewish community and to further develop her Jewish identity, gives me a unique viewpoint. I know what being Jewish means to her. This experience, coupled with how I understand scripture, has resulted in my current theological perspective, and I’ve made peace with that. It’s actually very liberating to know who I am relative to God and also relative to Israel. I don’t have to try to force myself into a religious paradigm I wasn’t designed for and one that wasn’t designed for me. Probably no one perceives themselves as “arrogant,” and I realize that is not your intent. I understand that you are truly sincere in believing you are obligated to the Torah mitzvot in the manner of the Jewish people. I also believe you experience Torah observance as a need and even a “right”. However, and this is just my opinion, there are plenty of people who experience certain things as “needs” and “rights” that turn out to be “wants” and “desires”. If I’m right and the Sinai and New Covenants were made exclusively with Israel, and we “grafted in” Gentiles are not actually Israel, then even with the best of intentions, declaring that something belonging exclusively to our neighbors is ours also, will still feel like “misappropriation” to the rightful owners. That’s where I see humility coming in (and my quote from Luke 14:7-11). If I’m wrong, then the worse that happens in the Messianic Age is that Messiah corrects me and seats me at the banquet table at a higher level of honor. If I’m right, then the worse that will happen is that I keep my seat in the “last place” at the banquet table, the one I selected in the first place (well, not the first place…it’s taken me years to figure all this out). Just be careful which seat at the banquet you select for yourself. That’s all I’m saying. Here’s something for you to consider. Each human as an earthly father–except Adam who’s Abba was HaShem Himself. His Dad was G-d. Think about that for a moment. And so think about the fact that the Apostolic Writings encourage us to call HaShem “Abba”. Now, if that is a lie then I should do as you ask me and be careful which seat I take at the banquet. But I don’t think it’s a lie. Rather, I think G-d wants His children at the banquet. Thank you for this. I really enjoyed the meditation. I didn’t say we wouldn’t be invited, and I never said we couldn’t consider Hashem as our Heavenly Father. But to extend the “banquet table” metaphor, not everyone can sit in the same seat next to Messiah. @Kholinar: You’re welcome and thank you for your kind words. @Peter — I don’t know if you will find the following clarification helpful, but your translation of “law” or Torah as “fatherly instructions for achieving good” is not accurate because it is highly over-constrained. The Tenakh refers also to the torah of one’s mother, and, in fact, a mother’s teaching is often even more influential and more indicative of caring and investment of herself than that of a father. Stick with the simple rendition of “instruction” and you will have a more accurate understanding and guide to interpretation. As for non-Jewish, not-covenantally-obligated interaction with Torah, neither the Shabbat, nor the Pesa’h, nor even the encouragement to call HaShem “Abba” was directed at anyone but Jews. Nonetheless, HaShem commends “b’nei nechar” (“foreigners”, as seen from a parochial Jewish perspective) for clinging to the covenant as embracing it from the outside, honoring the Shabbat (even if not consecrating it as Jews are obligated to do). He promises them a “yad va’shem” (sometime translated as a name and a memorial, but perhaps better rendered as a power and a purpose) even better that that of sons and daughters, which is everlasting and shall not be cut off. That’s a pretty powerful affirmation, not to be dismissed because of over-reaching by grasping at more participation in the covenant than has been allotted. I would recommend not worrying at all about the seating arrangements at the ultimate heavenly banquet — indeed, as Rav Yeshua taught in his parable of Lk.14:7-15, his recommendation was to take (whatever appears to you to be) the lowest place, so that you may be elevated to a higher one by the Host Himself, thereby gaining the greatest possible honor of personal attention. Thus, in the worst case, even if you went unnoticed entirely because you actually deserved the lowest place, you would be honored for having chosen correctly. Remember that all the guests at this particular banquet are already a select group who have denied themselves self-seeking pleasures and have instead sought the kingdom of heaven as their primary value. Law isn’t law unless it conforms to the will of G-d the Father. 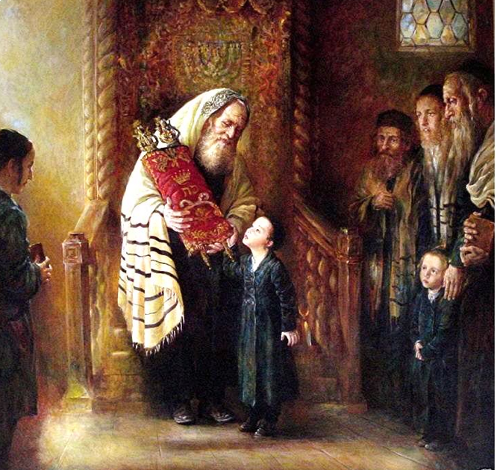 So no matter where you find the Torah, the source is always the same: the Father. Hence, I referred to “fatherly instructions.” When a mother speaks words of Torah that means her words comport with the will of the Father–that it IS the Father’s Torah. Otherwise it isn’t Torah. I don’t know why anyone thinks daily life is clear anyway. I’ve been reading about Hasidic communities that conflict with each other for not doing things the same way. And I ran across (a clip my mother had sent me years ago) an old article (from my home city) yesterday of different Lutherans (and not Lutherans generally, but those within a specific denomination of them) conflicting with each other, and I don’t think there’s an end to that kind of thinking. I apologize; the article I linked to just above is either redacted (in full) or not available to people who don’t subscribe. Best guesses. This is the same story generally, but has the added dimension of the person (president of the organisation) who demanded an apology apologizing for making a story of it. The prohibition on worshiping with other Christians stems from the synod’s 19th-century history in Germany, when its members were forced by the government to accept Calvinism against their will — and fled to the United States to preserve their religious freedom. The 2.4 million-member church, based in Kirkwood, is the second-largest Lutheran denomination in the country after the Evangelical Lutheran Church in America, which has twice as many members. I was never Lutheran. But I went to a Lutheran high school in St. Louis [had also gone to 7th and 8th grades at a church school, Concord Lutheran]. Not everyone who went to the high school and was Lutheran was Missouri Synod, but some were. They thought the Lutherans who weren’t shouldn’t be allowed to go there. We had chapel every morning. I take it we were doing a bad thing. The teachers took turns leading chapel, and they weren’t all Missouri Synod. Do you agree with PL’s statement that the invitation to call G-d “Abba” was only directed at Jews not Gentiles? Perhaps it’s possible to argue that Paul’s letter to the Romans “toggled” back and forth between addressing Gentiles and Jews, but it’s generally accepted that his epistle to the Galatians was addressed to a non-Jewish readership, so it looks like Paul applied “sonship” in Messiah to this audience as well as to the Jews. True, this refers to “eunuchs,” however you choose to interpret the term, but the subsequent verses addressing “foreigners” seems linked to these, so I think it’s reasonable to believe that Hashem considers even the believing Gentiles as His “children”. @Marleen: Your articles point out the differences between the various denominations of Christianity and even between different Lutheran synods. If you’re suggesting that there are distinctions between different branches and expressions of religious Judaism, that’s probably true (though I’m hardly an expert). At the core of the One Law argument, and probably for those of us who call ourselves “Messianic Gentiles,” is the desire to have a fixed and understandable set of laws or expectations of God upon us, just as the Jewish people have in the Torah. The One Law solution (I’m being overly simple here) is that the Torah of the Jews is also the Torah of the One Law Gentiles. It’s the path of least resistance, since there’s no requirement to consider distinctions. Just do what the Jews do and you’re solid with God. This assumes that all religious Jews everywhere interpret the Torah (and consequently Talmud) in exactly the same way, and that a single religious Jewish praxis is universal among Jews. Except, in my experience, One Law Gentiles still interpret and modify Jewish praxis, as they understand it, to fit their own paradigms (there’s more than one). Often, their basic Christian theology and doctrine is largely intact, with just a few “Hebraic” adaptations. Then there’s the virtual “phobia” regarding Talmud and the belief that the literal “five books of Moses” contain 100% of the information necessary to adequately perform all of the mitzvot. My personal opinion is that behavioral expectations of God upon humanity vary between covenant and non-covenant members. It’s what the epistle to the Galatians and Acts 15 were all about…Jews trying to solve the riddle of how a non-covenant people, the believing Gentiles, could benefit from the blessings of a covenant (in this case, the New Covenant) made with only the house of Judah and the house of Israel by said-Gentiles attaching themselves to Israel through their trust in Rav Yeshua. I believe a life of faith is a journey of discovery, not a destination. We travel all our lives attempting to draw closer and to understand better our “traveling companion” and Rav. Even his Jewish disciples didn’t always understand him, and they were much better positioned to do so than we Gentiles who are 2,000 years and half a world removed. As the first night of Pesach approaches, these matters weigh heavily upon me. The only problem is that you put “children” in quotes as if you harbor some doubt that we are indeed to be considered as His children. But when you are able to take out the quotation marks and fully believe without any qualification that we are His children (just as Adam was G-d’s son–Luke 3:38) then you will have to accept that the must be a COVENANTAL relationship (just as Adam had a covenantal relationship with G-d–Hosea 6:7) because a father-child relationship CREATES a covenantal relationship (i.e. it’s not really a father-child relationship if the father is not required to treat the child like a his own flesh and blood). If you CAN call G-d “Abba” then there IS a covenant and you, James, must reject your former position that Gentiles have a NON-covenantal relationship with G-d. I pray that you will overcome your doubt! As far as somehow magically we Gentiles have a covenant relationship with God, I don’t see it (and believe me, I’ve looked). Except for the covenant God made with Noah (all living things, really), we non-Jews do not have an implicit covenant relationship with God. We have a relationship with God at all because A). He made all human beings in His image, and as His creations, we belong to Him, and B). because of His infinite grace, kindness, and mercy, He allows us to come alongside Israel, His covenant people, through our trust in and fealty to Rav Yeshua, the mediator of the New Covenant (Note this does not make us Israel nor does it obligate us to the conditions of the covenants). As far as my doubt, only a fool would be dead certain of exactly everything there is about the nature and character of the Infinite One God, so yes, there are things I don’t know. On the other hand, I’ve some to a place of peace with my understanding of my relationship with Hashem through my trust in Rav Yeshua. Family=covenant. Saying “we belong to His family but it’s not a covenantal relationship” is like saying “I’ll concede that 2+2=4…but I also maintain that 2+2 does NOT equal 4.” That makes no sense. You can’t say “we’re family yet not family.” You’ll have to summon the courage to make a choice here because, logically, you can’t have it both ways. 2+2 either equals 4 or it doesn’t. Peter, I feel you’re engaging more in eisegesis than exegesis. Every single covenant we have in the Bible is described in highly specific language. To the best of my knowledge, there is no covenant recorded in the Bible that says “family = covenant”. You are engaging in a lot of loose metaphor and even allegory to make our relationship with God covenantal. Your logic doesn’t even begin to describe the conditions of this “covenant” you relate. Sorry, but I see nothing wrong with both my interpretation of scripture to define my relationship with God and the abundant blessings and mercy that God shows me because of His kindness and grace. Oh, by the way, On Friday evening during our family seder, When I came to the part of the haggadah containing Dayeinu, I momentarily paused remembering the content of this blog post. This year, the recitation had a wider meaning for me that it has in the past. I also have to say, it was a great seder. I had all three of my kids present as well as both grandchildren. This was my almost-10 month old granddaughter’s first seder. Naturally, she didn’t understand what was going on, but my seven year old grandson is gaining a better comprehension with each passing year. At one point, my granddaughter, who’d been “hanging out” under the table, grabbed my chair and decided to see what I was doing. A very cute moment. My grandkids’ Dad is slowing becoming more religious (which is to say, he’s considering Judaism at all), so there’s hope. I’m happy for you, James. Thanks, Marleen. Family is what it’s all about. James, where is a single covenant in Scripture recorded that is NOT described in familial terms? All covenants are extensions of the familial covenantal nucleus. If there is no familial covenant then there is nothing to extend and therefore no basis for any other covenant. @Peter: The covenants are, Noahic, Abrahamic, Mosaic, Priestly, Davidic, and New. Except for the Noahic covenant, every single other covenant is made specifically between God and Israel, or some subset of Israel (Priestly and Davidic). None, absolutely none of those covenants are made with non-Israel with the exception of the aforementioned Noahic covenant. You can’t point to any of those covenants besides Noahic and say that somehow non-Jews are included too as formally named participants. It doesn’t exist in the Bible. I’m sorry to rain on your parade, and you can choose to believe anything you want, but you’re reading into the Bible something that isn’t there. Oh, when you say that all covenants are “familial,” since God made the Noahic covenant with all living things (people, animals, plants), how does that translate into “family”? Each covenant–and we’re only talking about covenants made with people–is an expression of treating someone like family (e.g. G-d is a Father to His children Israel, G-d is husband to His wife Israel, a suzerain is a father to his children vassals, one ethnic group is a “brother” to another ethnic group via a covenant, etc, etc). Each covenant, by using familial language (e.g. brothers, father-child, husband-wife), indicates that a covenant is about recognizing someone as family. You don’t have to have any fancy formalities to have a covenant. I inherently have a covenant with my child for example just because she is my child. I am required to be a father to her, to protect her, care for her, teach her how to be a good person, etc. This is a covenant of family. So the very first covenant between G-d and man (which you forgot to mention in your list) was made with Adam who was family with G-d–Scripture literally says that G-d was the Father of Adam. So there’s no getting around the fact that covenant from the very beginning was about family. Which is why you should reassess your position that Gentiles have a non-covenantal (i.e. non-familial) relationship with G-d. But I guess we’ll have to agree to disagree. Good conversation though. You bring up an interesting point. It’s very easy to find information about the Adamic Covenant in Christian literature, but this concept is much harder to define within Jewish literary content. I tend not to focus too much on the Adamic Covenant because there’s no direct provision for managing the consequences of Adam and Havah (Eve) having failed to uphold their obligations to God, whether in the New Covenant or elsewhere. It’s only hinted at in Genesis 3:15. Also, the Adamic covenant is typically abused by adherents to Christian “Covenant Theology,” particularly to manufacture non-existent covenants such as The Covenant of Works and the Covenant of Grace, often preached about by men such as R.C. Sproul. Since I tend to see and understand the covenants through a (more or less) Judaic lens, does Judaism have anything to say at all about God and Adam having a covenantal relationship? In medieval Jewish philosophy the notion of the special status of the Jewish people found articulate and radical expression in Judah Halevi ‘s Kuzari. According to Halevi, the entire Jewish people was endowed with a special religious faculty, first given to Adam and then bequeathed through a line of chosen representatives to all of Israel. As a result of this inherited divine influence, the Jewish people were uniquely able to enter into communion with God and Israel’s election implied dependence on a special supernatural providence. This doesn’t really seem to help clarify things much since it seems that this special quality was not retained by all humanity, but ultimately transferred to the Jewish people, much like the covenants were passed on specifically through Abraham, and then Isaac, and then Jacob. In biblical terms, God relates to his universe and the creatures within it, including man, through a system of covenants. We are all familiar with God’s covenants with the patriarchs and Israel. Yet the Bible teaches us that God’s covenant with Israel must be viewed in the larger context of God’s covenant with all men. The Talmud teaches that the beginning of this covenant relationship is implicit in God’s relationship to Adam, particularly after man acquires knowledge of good and evil, but the first formal covenant was made with Noah after the flood (Genesis 9). Through Noah, the Talmud teaches that covenant is binding on all people as the basis for universal law. This indicates that God and Adam had an implicit but not formally stated covenant relationship, and that God’s formal covenant with mankind creating “universal law” was later established with Noah. The Jewish worldview suggests that man and God are partners in the management of the world. This partnership began when God delegated to Adam the right to name the creatures. Adam, however, was entirely dependent upon God’s good will. With Noah, the partnership is regularized through a covenant which is interpreted by the sages as having a political component in the requirement to establish courts of justice, or government, in the world. The Talmudic discussion of the seven Noahide mitzvot is very revealing in that it suggests that six of the seven mitzvot were already demanded of Adam, but in effect, the sages teach us, they were not put together into coherent doctrine based upon a formalized relationship between man and God until God covenanted with Noah. The basis of man’s relationship with God, the world and his fellowmen remains rooted in the covenant-created partnership. This very interesting since, from this Jewish writer’s viewpoint, Adam’s relationship with God was entirely dependent on God’s grace and mercy, not on any formalized covenantal relationship such as the one God would later form with Noah. But this is exactly how I describe non-Jewish Yeshua believers and our relationship with God today. Yes, we have a relationship with God, but it is not formalized as such, just like Adam’s relationship with God. Like Adam, we too are totally dependent on God’s good will to establish and maintain that relationship. Like Adam, we also have some basic, generic responsibilities to be good stewards and repair the world. So in that sense, I suppose I could make a connection between us and the “Adamic covenant”. Adam did break the “covenant” with God and God’s trust by committing the one and only act of rebellion he could, partaking of the fruit of the forbidden tree, so I can see the analogy the prophet was going for in Hosea 6:7. But unlike traditional Christian interpretation, which somehow manages to link the Adamic covenant to the New Covenant and Jesus (Yeshua), Judaism, whether Messianic (although there may be congregations out there calling themselves “Messianic” that are still sufficiently “Christianized” to retain a great deal of Church theology and doctrine) or otherwise, doesn’t see such a link, certainly not through the Christian Jesus and also not through the traditional Jewish understanding of the Messiah. From normative Judaism’s point of view, Gentiles are “saved” by faith in Hashem and observance of the seven Noahide Laws. From my perspective, we are granted the blessings of the New Covenant, not because we are members of the New Covenant as such, but because we accept the same sort of relationship with God that Adam had, one based on our total reliance on God’s grace and mercy. However, by becoming adherents to Rav Yeshua as our Rav, we come alongside Israel and symbolically participate in the merits of the New Covenant blessings, specifically the promise of the resurrection, the indwelling of the Spirit, forgiveness of sins, and reconciliation with Hashem. Who do you consider to be the “Christian Jesus”, the false trinitarian spoken of person, or the real Christians their idea of Jeshua, him being the sent one from God (as said in the Scriptures), a very import rabbi and prophet and not a part of a triune godhead but the son of man and the son of God? In this case, I was referring to the “Gentilized” version of the Messiah we read of in the Gospels as opposed to the Jewish Rav who was dedicated to restoring Israel. By the way, all three of your comments ended up in my spam bucket for some reason. I thought I’d “unspammed” all three, but one was apparently lost. Peace be with you James. It is not clear yet who your “Gentilized” version of the Messiah is. Is it Jeshua, (Jesus Christ) the sent one from God, we as Christians consider to be the son of man and the only begotten son of God, or is it the person several so called Christians consider to be one godhead from their trinity? guestpeaker, I assume you’re trying to pin me down on my opinion on the Trinity. It’s a highly controversial subject, at least in some circles, and can occasionally inspire some rather “spirited” debates. A few years back, I wrote a four part series on Exploring Messianic Divinity. It’s not the definitive answer to such a profound mystery, but it offers a different perspective than you’ll typically find in Christianity. We have to ascertain that there are people who call themselves Messianic Jews but do not worship the God of Abraham, but made Jesus into their God. for us Christians believing in Only One True God such a belief in the holy Trinity seems to be a contradiction with Judaic and real Christian faith. So we wondered what your belief is and what you are preaching. I’m not “preaching” anything. I just write a blog. In my bio, I don’t claim any specific qualifications or knowledge, nor do I believe that I’m always “right” (unlike a lot of folks in the blogosphere). I’m simply expressing my personal views. Readers can take them or leave them as they see fit, guestpeaker. Thanks for replying and hoping to encounter you blogging for a long time. Good luck. Concerning messages entering in our and others spam box is a problem we are facing when sending replies or reactions form our office where more than one WordPress account is used but all goes along one and the same server, which changes at regular intervals its up address for safety, but makes it sometimes having replies prepared on one address but send on an other, having the respondent receiving it from a non-connected source. It is a problem we encounter even on our own messages. We already loosened certain security measures to be able to ‘like’ or to ‘reblog’ articles, because at a certain point we had made the security so strong such ‘share’ and ‘like’ buttons could not be seen by people in our office and nothing shared.